Santa Teresa, NM - A huge new coil center was recently dedicated on a 7 acre site in Santa Teresa, NM, on the US-Mexico border adjoining El Paso, TX, by Southwest Steel Coil, Inc., a subsidiary of Calstrip Industries, Inc., Los Angeles, CA. 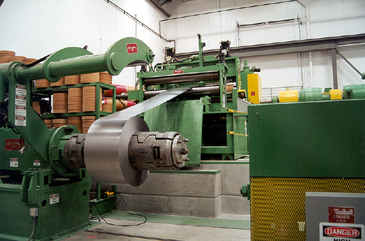 Southwest Steel Coil will distribute and process prime quality carbon and stainless steel coil for the metal stamping and forming OEMs in the southwest USA region as well as those in northern Mexico. 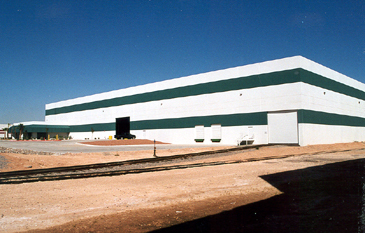 The Southwest Steel Coil facility is designed with the ability to receive and ship coils by truck and rail, with coils handled by 30-ton capacity overhead cranes. The facility is equipped with a new high production 60" x 1/4" slitting line complete with an automated slit coil packaging line. 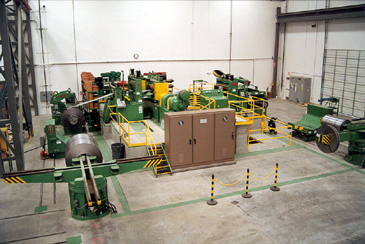 The slitting line is a new "state-of-the-art" single loop-high production "Generation V" coil slitting system designed and manufactured by Braner/Loopco, Schiller Park, IL. The slitting system is designed to process coated and bare cold rolled and hot rolled pickled carbon steel coils as well as 300 and 400 series stainless steel coils. The line has the capacity to process coils weighing up to 50,000 lbs., in widths to 60", with coil diameters to 72". The slitting capacity for all products is from .010" through .250" thick, at line speeds to 1,000 FPM. Individual slit coils weighing up to 10,000# are separated, downlayed, strapped, and palletized for shipment on an automated slit coil packaging line. The slitting system is capable of producing high quality, close tolerance, and tightly wound straight wall slit coils throughout the gauge range. Entry and Exit 4 Arm Turnstiles are utilized to reduce dependence on overhead crane service. An infrared fiber-optic edge detector provides automatic coil tracking and alignment at full line speed. A "Turret" slitter equipped with three quick-change 9" slitter heads and a 150 HP-DC drive allows Southwest Steel Coil to efficiently process long and short production runs with minimal re-tooling downtime. The Turret slitter, tooled with slitter knives and spacers precision lapped to within 40 millionths of an inch, produces precise tolerance slit coils with minimal edge burr. A 50-foot deep looping pit and Strip Tensioning Equipment allow the production of light gauge narrow width 1,000 PIW slit coils with no equipment-induced camber. Coils are rewound with strip tension generated by a 250 HP-DC motor, assuring tight straight wall slit coils throughout the gauge range. Coil Threading: Faster threading of all gauges and materials through the line. Coil Breaks: Elimination of cross breaks caused from reverse bending under tension. Surface Quality: Elimination of deflector roll induced strip surface scuffing. Coil Quality: Elimination of coil oscillation caused from reverse bending of the strip. Productivity: Faster line threading plus consistently higher slitting speeds are made possible by the fact that the strip is never reverse bent under tension.